A treble like no other. The Swiss are a triplet who do not wish to directly associate themselves with the “D” word, yet their grooves are undoubtedly crisp and give that “d” word their own meaning. They define originality with their ability to create a mood that they want to create on the dancefloor – that cool, groovin’ chill. Then they’ll make you sweat. I had the opportunity to catch a chat with Tony, the drummer extraordinaire who, when playing live, doesn’t just play the beat, he is the beat. 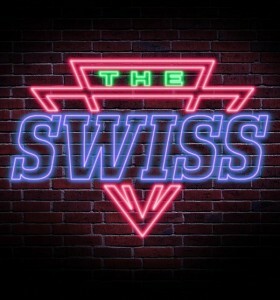 Who are the characters behind The Swiss? 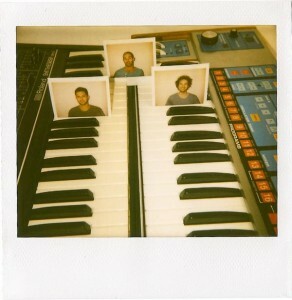 Luke plays synths and is the one with the curly hair. Sid playsa the bassa and is the one with the and and I’m Tony, I play drums and like heavy techno. What is the story behind how you gentlemen started this group? We were all in high school and shared a love of Herbie Hancock and prog rock. I guess we were smart enough to know these passions weren’t going to get us any girls so we started a band. 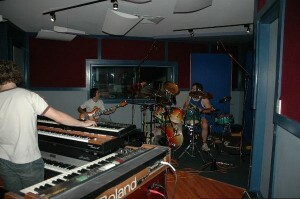 Do your recordings mainly consist of recording live off the floor or “in the box”? We go into the recording studio with our producer Donnie Sloan and spend hours setting up microphones and tuning drums, then we all play along together for a couple of days. Donnie takes all this stuff, takes a few weeks refining it at his home studio and bam – there’s a record. Who is in charge of producing and engineering your tracks? Donnie “Johnathan” Sloan – he also did production & writing on the Empire Of The Sun album, who Sid & I play for at live shows. So it’s one big happy Australian family. How does playing live with actual instruments give you a different edge to your performances? I think compared to seeing a DJ it’s just way more fun. We’re not the kind of band where everyone stares at the stage and applauds at the end of the song though, we like people to dance. Actually no, we need people to dance. What sort of vibe do you try to achieve when performing? Sweaty. We’re working really hard at building tension and drops and stuff like that at the moment. Kind of like the way a really good house music DJ does. The main focus is having fun, we try to be serious about playing so the crowd can not take it seriously at all. Any new releases on the way? Yep we’ve got another double single out in the next couple of months that we’re ridiculously excited about. A few remixes here and there as well. We’re also going to get around to doing our first ever mixtape one day. In your eyes, who have been some of the biggest acts for you this year? I really like Boys Noize and Tiga and stuff like that. It’s awesome that the LCD Soundsystem album has charted. I saw ACDC a few months ago, that was pretty cool. Azari & 111 are brilliant and we’re completely obsessed with Tensnake. There’s a lot of cool stuff around, and a lot of big stuff around but not too much that’s big and cool, except Katy Perry. On your myspace page it says that you guys sound like the “d” word. Explain? Haha, we kind of got sick of everything in the club world being referred to as disco. It’s become a dirty word in the same way electro did a couple of years ago. Both of these descriptions have completely lost their original meanings, so we imposed a moratorium on the word disco. What do you guys hope to have achieved by the end of this year? The European tour we’re about to start, then playing some amazing shows back home in Australia after. Hopefully two more releases by Christmas and then a worldwide number single shortly after that should do it. The Swiss are currently playing across Europe. If you’re around these areas, it’s more than recommended to check them out! Much thanks to Tony for his time to do this interview with Salacious Sound. 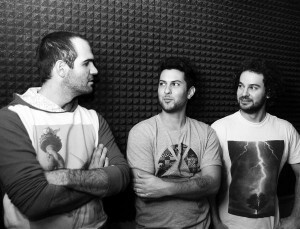 The Swiss are a special crew that have created their own unique sound within their tunes. With the help of Donnie Sloan behind the desk,Â the signal flows and he supplies that sublime fine tuning which gives The Swiss that rich, warm analogue sound all lovers of music are quite fond of. and purchase their tracks on Digital Turntable Lab!